An increasing number of elected officials and progressive activists associated with the Democratic Party are rallying behind calls for the abolition of U.S. Immigration and Customs Enforcement (ICE), the federal agency responsible for preventing cross-border crime and illegal immigration. Sen. Kirsten Gillibrand (D., N.Y.), who has been frequently touted as a potential 2020 Democratic presidential candidate, became the most high-profile elected official to call for abolishing ICE during a Thursday appearance on CNN's "Cuomo Prime Time." Shortly after appearing on the show, the senator took to social media to elaborate she had come around to support the opinion ICE was now a "deportation force" and needed to be replaced with "something that actually works." "I believe we need to protect families who need help, and ICE isn’t doing that," Gillibrand tweeted. "It has become a deportation force. We need to separate immigration issues from criminal justice. We need to abolish ICE, start over and build something that actually works." While Gillibrand may have become the first sitting senator to signal her support for abolition on Thursday, a few of her colleagues in the House had already singled their support for the issue. On Monday, Rep. Mark Pocan (D., Wis.) announced he plans to introduce legislation that would abolish the immigration enforcement agency. Rep. Earl Blumenauer (D., Ore.) later announced he would join Pocan in introducing the legislation. "We should be prioritizing the protection of families and our borders in a humane and thoughtful way. People should be treated with compassion and respect. ICE is simply not doing that," Blumenauer said in a statement. 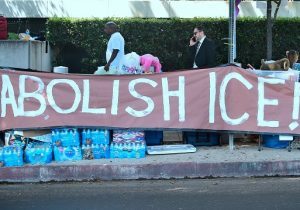 "Trump and his administration have made the agency so toxic that it’s time to abolish ICE, and start over." Several progressive organizations, activists, and Democratic candidates have also raised the issue as their cause. Get the children out of cages. Get their parents out of jail cells. Get rid of the immigration agencies responsible for these atrocities. We need #FreedomForImmigrants. Our communities will only see relief when we #AbolishICE & #AbolishCBP!